Obituary for Jacqueline Gay (Albertson) Newsome-Randick | Crandall Funeral Home Inc.
Jacqueline Gay Newsome-Randick, age 86 peacefully passed at home July 27, 2018. Jackie was born June 2, 1932 in San Bernardino, California to Alfred and Katherine Albertson. In August 1950 she married Earl Newsome and together raised four children. After his passing in January 1996 of surgical complications she married Richard Randick July 27, 1997. 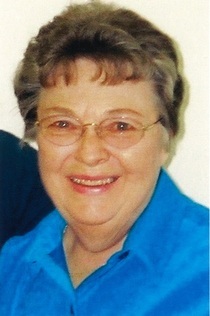 Jackie was a member of St. Paul’s Episcopal Church. She taught Sunday school, sang in the choir, was in ECW, on the alter guild and filled in where ever she could. Jackie worked at Safeway, Kurt’s Thriftway, and Farmer Jacks in the meat market, and as a checker and deli manager. She was a loving mother who truly enjoyed life. She loved working in her garden, arts and crafts, oil painting, refurbishing old furniture, and was an avid rock collector. She made friends easily and seemed to love meeting new people. She would carry on lengthy conversations with even total strangers, often hugging them, adding them to her friends list. But above all, she enjoyed spending time with family and friends. Jackie is survived by her husband Richard Randick, four children: Susan (Jim) Williams. David Newsome, Daniel (Julie) Newsome, Leslie (Daryl) Ervin, six grandchildren. Natalie, Brooke, Damon, Ryan, Colby, Mackenzie and seven great grandchildren. There will be a viewing Tuesday July 31, 2018 from 6-8 pm at Crandall Funeral Home. Funeral services will be held at St. Pauls Episcopal Church Wednesday August 1, 2018 at 11am. In lieu of flowers donations can be made to the Alzheimer’s Foundation, 2232 Dell Range Blvd. #220, Cheyenne, Wyoming 82009.